Want to quickly see how the open-source software PunBB works? You'll find a free and updated demo installation of PunBB here. We are currently updating the PunBB demo. Please check back shortly. There will be a new version up soon. 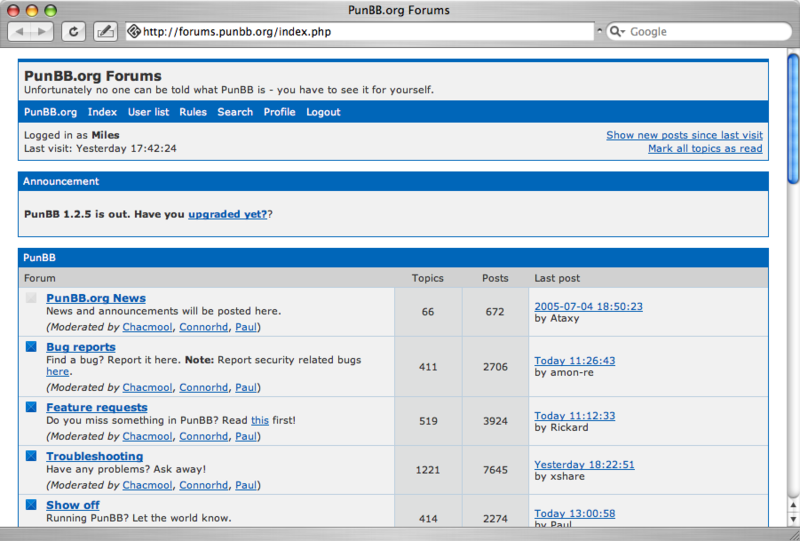 PunBB is a free lightweight bulletin board based on PHP initially created by Rickard Andersson as a personal project and first released in 2003. If you want to see what kind of features it has to offer you can set up your own PunBB demo. For a successful installation of the software you will also need a database like MySQL, PostgreSQL or SQLite. You’ll notice in your PunBB demo that it was designed to be fast and less graphically cluttered compared to other discussion boards. PunBB has fewer features than many other discussion boards, but is generally faster and outputs smaller, semantically correct XHTML-compliant pages.